I threw down a challenge to my fellow artists over at Outcast Studios to draw their own origin story as an artist. And I figured that having thrown down the challenge, it's only fair that I draw mine as well. I've been drawing ever since I can remember. But there was really one specific event that got me started taking it seriously: The day I saw Sleeping Beauty. The main elements I wanted to include were the drive-in theatre, the family's old camper van (which probably wasn't the car we were in, but it is the car I remember) the wicked-fairy-to-dragon transformation that started it all, and little me realizing that what I was looking at was drawings. I started doing some photo reference searching for locations and stuff, and started roughing out some thumbnails of how I might show that. 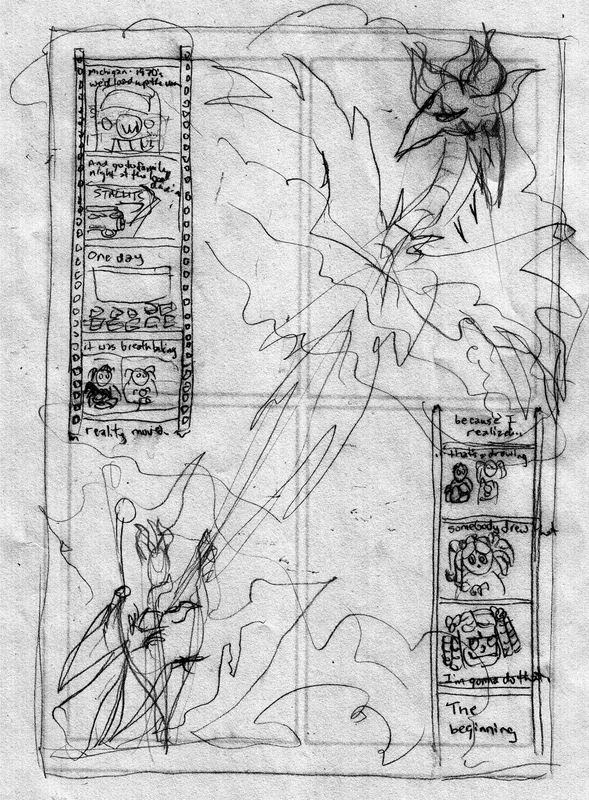 Of course, this meant that the top and bottom rows of narrative from my original thumbnails wouldn't work. 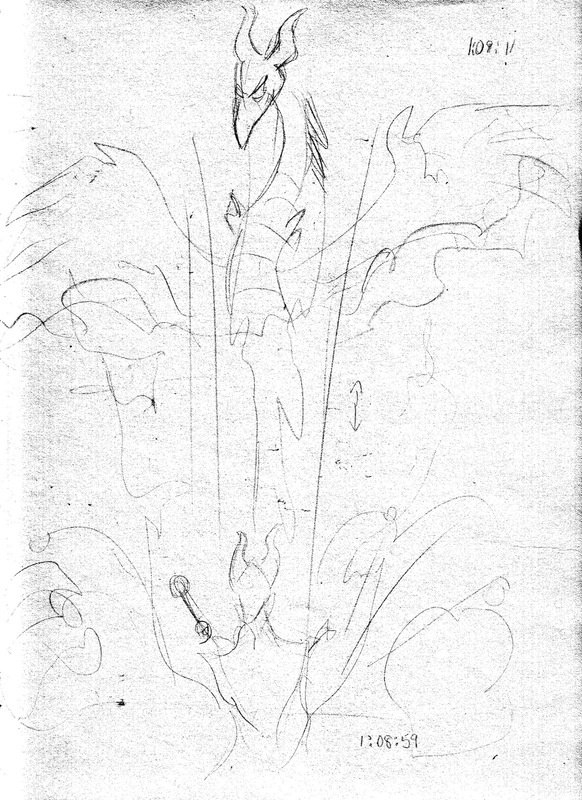 But it also gave me a fantastic reverse-N narrative flow to take advantage of. The next challenge is in how to force a western eye that is used to reading left-to-right to follow my up-and-down storyline. 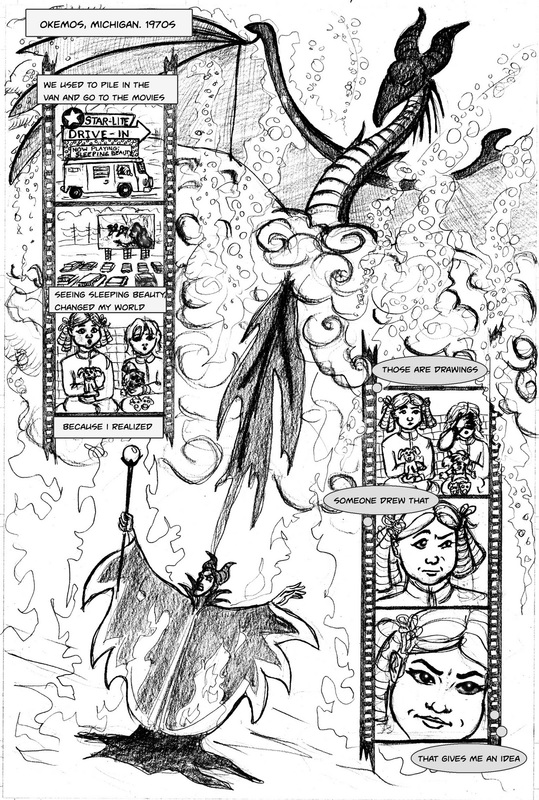 So I came up with the idea of using a filmstrip panel border for my opening and closing panel strips to connect them so strongly that there could be no mistake of where to look next. It also gave me a way to cement the real-life moments to the movie moments thematically. This did leave me with the issue of real estate on the page. But again, the reverse-N helps me out, if I just tilt my big strong vertical of the transformation scene so that it picks up at the bottom end of the first film strip and carries the eye to the top end of the next one. And shifting the horizon line on the page underlines my shift in mental horizon that happened during the scene, so I get to pull in the whole artsy symbolic thing. Lookit me, I'm fancy and sophisticated! Using all symbols and metaphors and stuff. Overall, I'm pretty happy with the way the page turned out. And before you ask, yes. Yes, I really did used to wear my hair in banana curls. I was a cute little kid and it was adorable. So there.